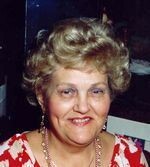 MACKO, Frances Ann - of Florida, formerly of Mt. Morris and Flint, age 77, died Thursday, December 9, 2004 at Comprehensive Health Care of Clearwater in Florida. Funeral services will be held 11am Saturday, December 18, 2004 at the O'Guinn Family Funeral Home in Clio, Rev. Matthew A. Smith officiating with burial in New Calvary Catholic Cemetery. Friends may call at the funeral home on Friday from 2-5 & 6-9pm and Saturday from 10am until time of service. Memorial contributions may be made to the family. Frances was born April 24, 1927 in Flint, Michingan the daughter of the late Francis G. and Emmerencia T. (Sefcovic) Kelso. She had resided in the Mt. Morris area from 1983-2000 before moving to Florida. She was a member of St. Lukes Catholic Church in Flint. Frances married Daniel P. Macko Sr. on November 22, 1947. He preceded her in death in 1982. Frances along with her husband owned and operated Mackos Formal Wear on Pierson Road in Flint. She was an avid game player especially bingo. Surviving are: sons, Daniel P. (Carol) Macko Jr. of Clearwater, FL, David J. Macko of Clearwater, FL, Timothy G. Macko of Flint, James A. Macko of Clearwater, FL, Mark A. (Sheryl) Macko of Omaha, NE; daughters, Clara J. Nabring of Clearwater, FL, Catherine M. Crowley of Clearwater, FL, Lucy M. (George) Harris of Eaton Rapids, MI, Frances A. (James) Sorge of Olney, MD, Theresa M. (John) Benham of Bridgeport; 19 grandchildren and 1 great grandchild; 1 brother,4 sisters and 2 sisters-in-law; several nieces, nephews and cousins. Frances was also preceded in death by 1 sister. Please sign our guest book or share an online condolence with the family at www.oguinnfh.com.